188 pages | 5 B/W Illus. How can we develop a comprehensive understanding of the research process in community, health and social care settings? Covering all stages of the research process, from funding to dissemination, this book considers the views of funders, researchers, communities and policy makers. Drawing on practical examples and relevant international literature, it sheds light on issues that can arise in the process and presents solutions and strategies to deal with a range of challenges. 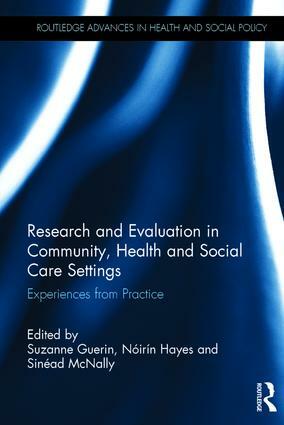 Organised around a series of themes that capture the essential elements of the research process including covering framing research in theory, commissioning and designing research, utilisation of findings and knowledge transfer, this book provides practical guidance for those involved in child welfare and education, nursing and clinical practices, community studies and the social sciences. It will be a key resource for all those who are interested in developing their understanding of the research and evaluation process in these areas. Suzanne Guerin is associate professor in research design and analysis with the UCD School of Psychology at University College Dublin. Her research interests include applied health and wellbeing, and applied research and evaluation. Suzanne has developed significant expertise in these areas and as a result is involved in a number of projects nationally and internationally. She is Deputy Director of the UCD Centre for Disability Studies and a member of the All Ireland Institute of Hospice and Palliative Care (AIIHPC) Palliative Care Research Network. Nóirín Hayes is a developmental psychologist with particular interest is early child development and learning, curriculum and pedagogy and children's rights. She is the author of a number of books, reports and research articles on early childhood education, practice and policy including Early Years Practice: Getting it Right from the Start (2013, Gill and Macmillan) and co-author of Introducing Bronfenbrenner (2017, Routledge). She has served on a number of government advisory and working groups and commissions, and is a founder member of the Children’s Rights Alliance and an honorary member of OMEP international. Sinéad McNally is an assistant professor in psychology at the Institute of Education at Dublin City University. She holds a BA in French and psychology (Trinity College Dublin) and a PhD in psychology (Trinity College Dublin). She is experienced in conducting and managing research in the academic and voluntary sectors in Ireland, and specialises in children’s earliest experiences and the factors that impact on children’s early health, language, and social-emotional development.